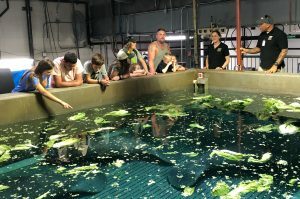 CINCINNATI (April 27, 2018) – To show their appreciation for the part that a family from Middletown, Ohio, played in rescuing a tiny manatee while on vacation in Florida earlier this month, the Cincinnati Zoo & Botanical Garden’s manatee care team gave them a special behind the scenes tour of the Zoo’s manatee facility today and let them see the new resident up close! The family also got to help select the name for the 250-pound orphaned manatee that arrived at the Zoo on Tuesday. They selected Daphne, a tribute to legendary conservationist Daphne Sheldrick, from the names that the manatee keepers provided. Rocky Road is the name that rescuers gave the 30-pound male that Millsap, her boyfriend Rickey Harbrecht, and her 11-year son, Rocky, saved. The fragile calf is receiving critical care at Miami Seaquarium. One-year-old youngster Daphne and her mother were rescued from Florida waters on Monday, April 9, after her mother was struck by a boat. The mother did not survive. 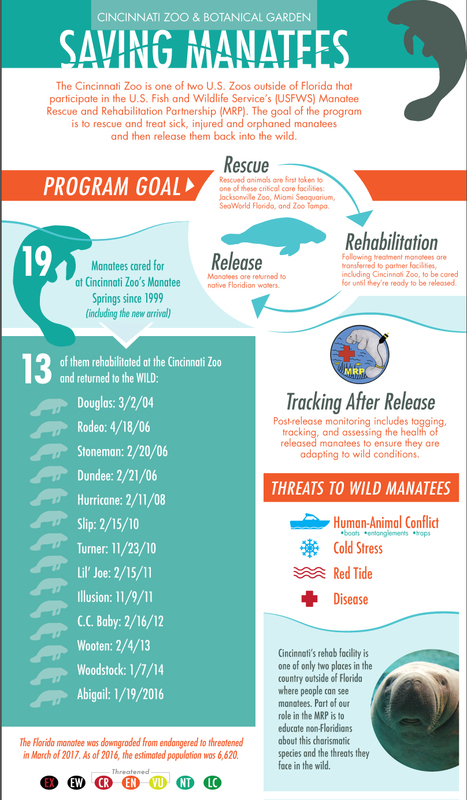 The Cincinnati and Columbus Zoos are the only U.S. facilities outside of Florida to participate in the USFWS’ Manatee Rescue and Rehabilitation Partnership (MRP), which began in 1973. They are second stage rehabilitation facilities that provide temporary homes for manatees until they are ready for release back into the wild. 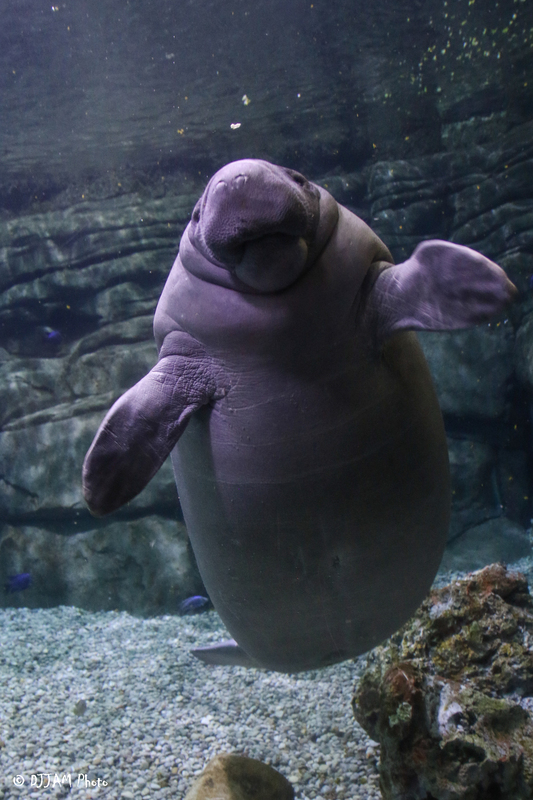 Daphne is the 19th manatee that the Zoo has care for since Manatee Springs opened in 1999. 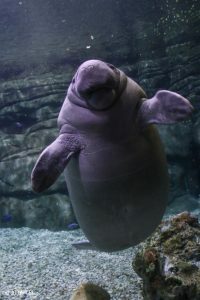 The Florida manatee, recently downgraded from endangered to threatened, is at risk from both natural and man-made causes of injury and mortality. 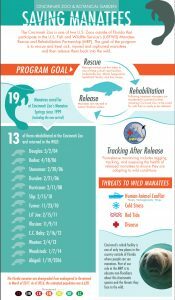 Exposure to red tide, cold stress, and disease are all natural problems that can affect manatees. Human-caused threats include boat strikes, crushing by flood gates or locks, and entanglement in or ingestion of fishing gear. As of 2016, the population was estimated to include 6,000 animals. Manatee Springs is open during regular Zoo hours. Matthew, Miles, Pippen and Daphne are usually swimming in the main pool but can be seen on a large monitor in the habitat lobby if they are in their behind-the-scenes pool.